Somehow, last year, we got a free subscription to The Economist magazine. It’s not on the top of list for “must reads” each week (New Yorker and Time hold that spot) but it can be interesting at times as it sees the news through a world financial lens. I’ve been noticing a free app that the magazine is touting called The World in Figures, and decided to give it a go to see what it is. The app is built around data from countries around the world, and the results come out as a sort of infographic format. You can search through categories such as education, crime and punishment, and freedom of the press, and see how countries are faring. You can even choose two countries and compare data points. Or you can randomly wander through topics or even use the trivia option to get random information about countries. The app is fairly easy to navigate and provides a glimpse at the world through numbers. I could see students using this app to gather information around important topics as part of a research query. The visual rendering of information is useful for understanding the world. 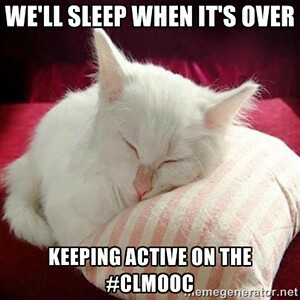 I’ve been doing a lot of digital “makes” this week for the Making Learning Connected MOOC, and it seemed like it was time to get off the screen and get my hands dirty. 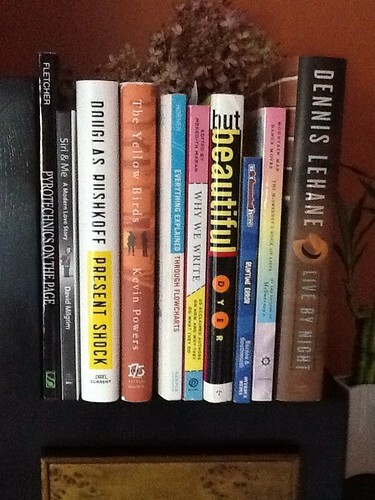 While I am not a gardener (and don’t play one on the Internet), I am the vigilant Compost Man in our home. So, what I make is black gold — the rich soil that grows our veggies and flowers. 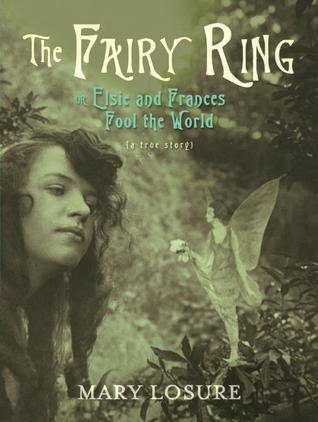 The Fairy Ring (or How Elsie and Frances Fool the World) by Mary Losure is a non-fiction account of two young girls in England who fooled the world, as the title suggests, by taking staged photographs of themselves with fairies. Even Sir Arthur Conan Doyle (he, of Sherlock Holmes fame) was drawn into the hoax by the young girls. As with most trouble, it all began rather innocently enough, with Frances and Elsie using a camera to take a picture by a remote glen, using cutouts of fairies with wings in the picture. This is 1917, and in England, some of the most intelligent scientific minds thought that fairies might be real — just outside the realm of the known — and even though we can look at the photos the two girls took (and there were not many, only four or five), it is clear that the fairies are not real. But to someone who wanted to believe, and to a world that had not yet understood the manipulation of media, the photographs were proof of the existence of fairies. It soon got out of control (media frenzy, spurred on primarily by Doyle’s public writing about the photographs) and the girls soon regret their hoax, but by that time, it was too late to come clean and too big a deal in the world, and in their family, to tell anyone the truth. In fact, it is only in old age that one of the two girls finally tells her grandchildren the truth of the matter, and the truth of the staged photos slowly trickles out into the world decades later. And yet, even years later, Frances truly did believe that she saw fairies in the woods — real fairies — just not the ones she and Elsie fake photographed. Losure does a nice job of using source material here to bring us into the heads of the girls, and to the setting of the hoax. While her writing is a little clipped (almost as if she were going for the Hemingway’s style, so that sentences are short and ideas are too the point), she unfolds the narrative in a linear way that allows the reader to forgive the girls and shake our heads at the BigWigs of the British community that took advantage of the girls’ childhood for media fame. It was important that she show us the photos, and she does. 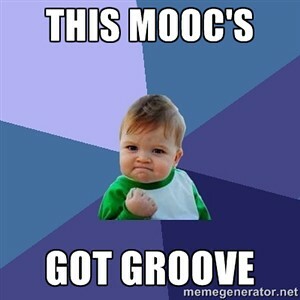 In the span of just a few days, I’ve come across some amazing ideas for digital “makes” in the Making Learning Connected MOOC that I am helping to co-facilitate. Here are a few of the things I’ve been creating as part of the introductory activities. 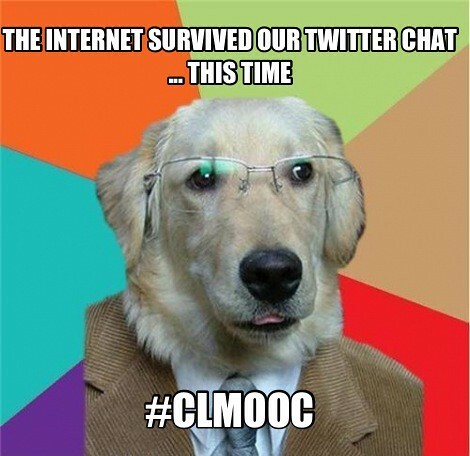 Yesterday, a member of the community began to make memes for the MOOC, and she is going to try to set up a system of memes to emerge over the six weeks of work. Memes are interesting, but only if they come viral in a community, and if you begin to try to make them, you realize how difficult it is to wed the right snarky words to the right snarky picture. I gave it a try but I don’t think either of these will be viral. I’m going to keep trying, though. 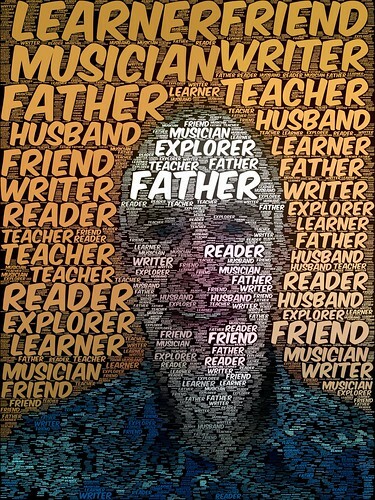 During the first days of the MOOC, lots of folks jumped into Vizify, which is a graphical biography that pulls data from your social networking connections. You don’t do much, other than allow it access to your streams. 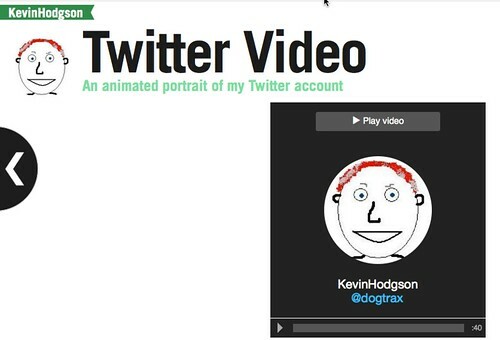 But I did find its Twitter tool sort of interesting, as it makes your Twitter data into a video. I have two weeks left to school (I know … long year) and we are working on two main projects now: an adventure short story and a unit on Hacking Literacies. Yesterday, I brought my sixth graders to the Hackasaurus XRay Goggles site, and we began playing around with the hacking tool. Of course, first we had a discussion (which we have been having all year) about how tools can help put more power (agency) into the hands of the user, so that they begin to see themselves as less consumer and more active producer when it comes to media (digital or otherwise). 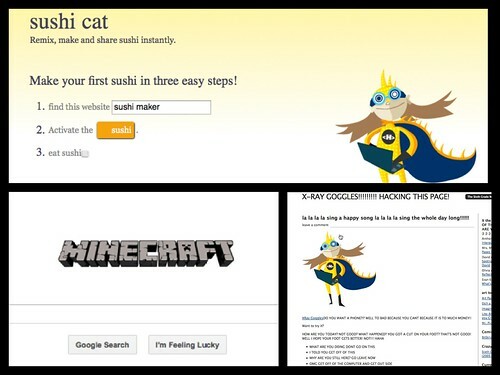 Some were hacking gaming sites; some were hacking our classroom site; some were hacking the Google homepage; some were at clothes shopping sites. The informal discussions were interesting, as they talked about how to parody companies and personalize sites. Today, I intend to continue this work, and I think I am going to bring them all to a single website (my brainstorm at 3 a.m. in the morning: the famous Tree Octopus hoax website) and have them be creative in their hack even as they examine why this is so famous a site. 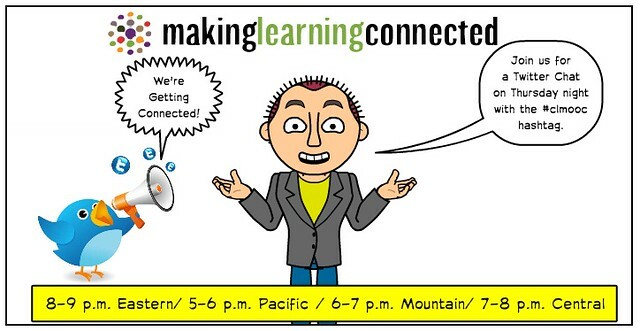 My friend, Terry Elliott, and I created the first “Make with Me” video for the Making Learning Connected MOOC, and we decided to focus on podcasting. Using audio was one of the suggested “makes” for the first week of introductions, and we wanted to be able to share out a few simple tools to lower the barrier for folks. We urge you to give podcasting a try, and to put your voice out into the world.